Surge actuator has a corrosion-resistant composite master cylinder and zinc plating, making it perfect for marine use. Leverlock coupler latch is easy to use. Electric lockout activates automatically to keep brakes from actuating when in reverse. 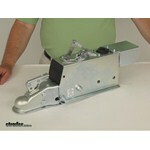 Call 800-298-8924 to order Demco brake actuator part number DM8605101 or order online at etrailer.com. Free expert support on all Demco products. Guaranteed Lowest Price and Fastest Shipping for Demco Hydraulic Brake Actuator w/ Electric Lockout - Disc - Zinc - 2" Ball - 6,000 lbs. Brake Actuator reviews from real customers. Surge actuator has a corrosion-resistant composite master cylinder and zinc plating, making it perfect for marine use. Leverlock coupler latch is easy to use. Electric lockout activates automatically to keep brakes from actuating when in reverse. When you apply the brakes in your tow vehicle, deceleration occurs and momentum pushes your trailer toward the rear of your vehicle. With surge brake systems, the hydraulic actuator is triggered as your trailer moves forward, once your tow vehicle starts to slow down. When this happens, the actuator contracts, applying force to its master cylinder. 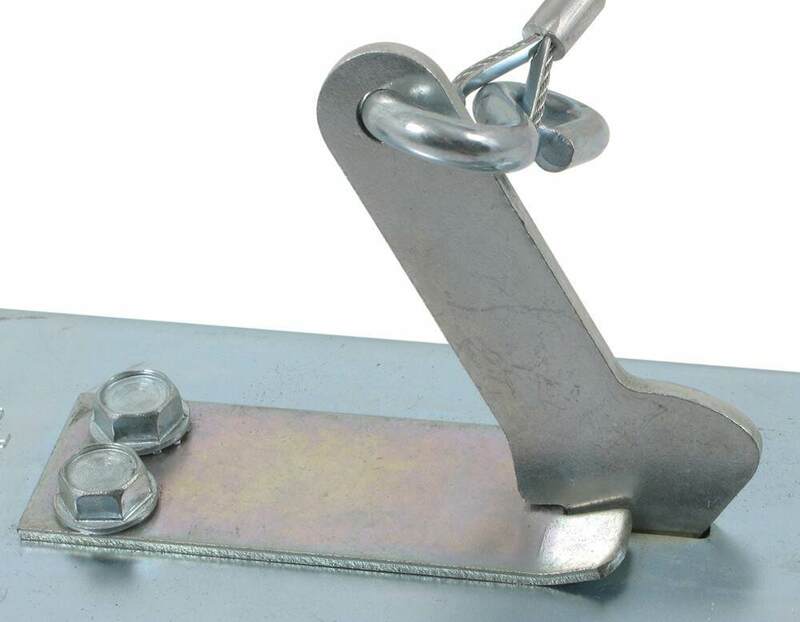 This in turn supplies the necessary hydraulic pressure to engage your trailer's brakes. 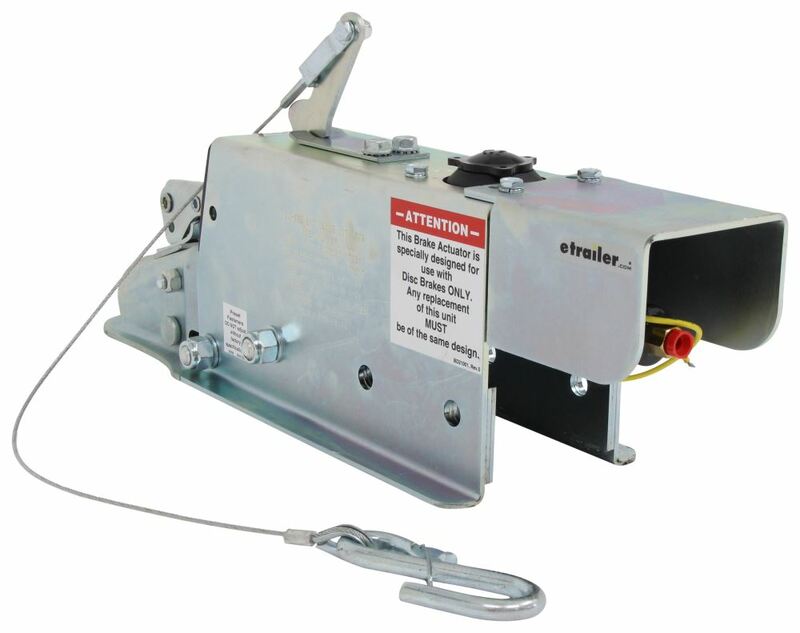 The electric reverse lockout on this trailer brake actuator is automatically activated when you shift your tow vehicle into reverse. The solenoid wires into your trailer connector - which connects to your tow vehicle - so that it can detect when you are in reverse. When your vehicle is in reverse, the solenoid ensures that the hydraulic actuator does not activate your trailer's brakes, thus allowing you to back up your rig. To use the lockout feature, you must have a 5-pole flat, 6-way round, or 7-pole trailer connector. 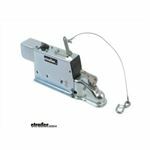 Made of sturdy steel, this hydraulic trailer brake actuator features a durable zinc coating that is designed to limit rust and corrosion. This zinc coat has a 500-hour salt spray rating, making the actuator perfect for marine use. In addition, the composite master cylinder is made of corrosion-resistant glass-reinforced nylon to further ensure durability for marine applications. Surge-type actuator features a corrosion-resistant composite master cylinder and durable zinc plating with a 200-hour salt spray rating. Easy-to-use leverlock coupler fits 2" hitch balls. 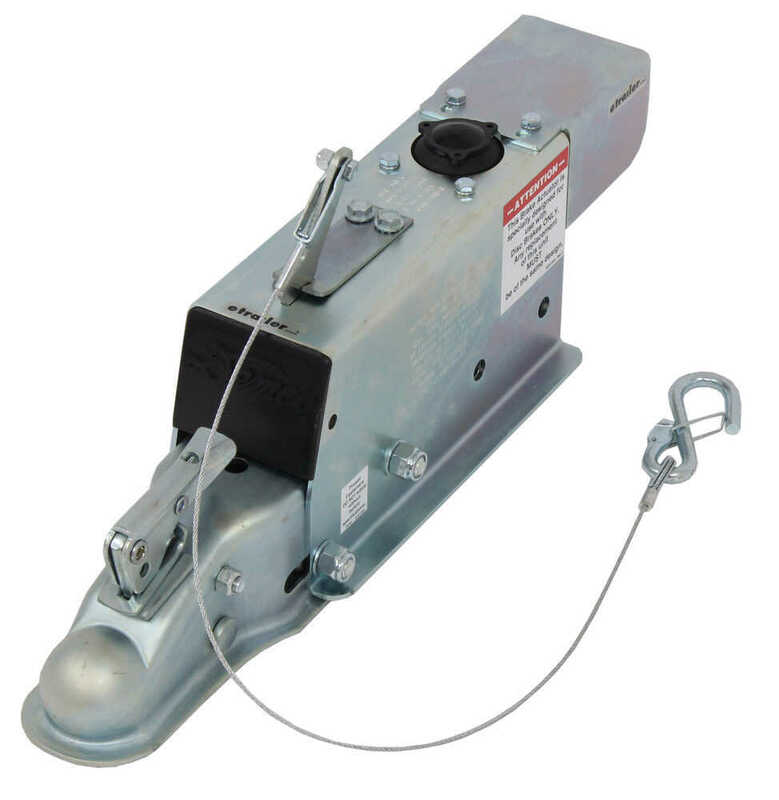 The electric lockout switch on this swing-away actuator lets you deactivate your trailer brakes so that you can back up with ease. Foldaway design is perfect for convenient storage of your trailer, even in small garages. Surge-type actuator bolts over 3" wide trailer tongue and includes standard, heavy-duty coupler with 3" drop. Electric reverse lockout lets you back up without activating the trailer brakes. Features corrosion-resistant plating. Today we're going to review part number 8605101. 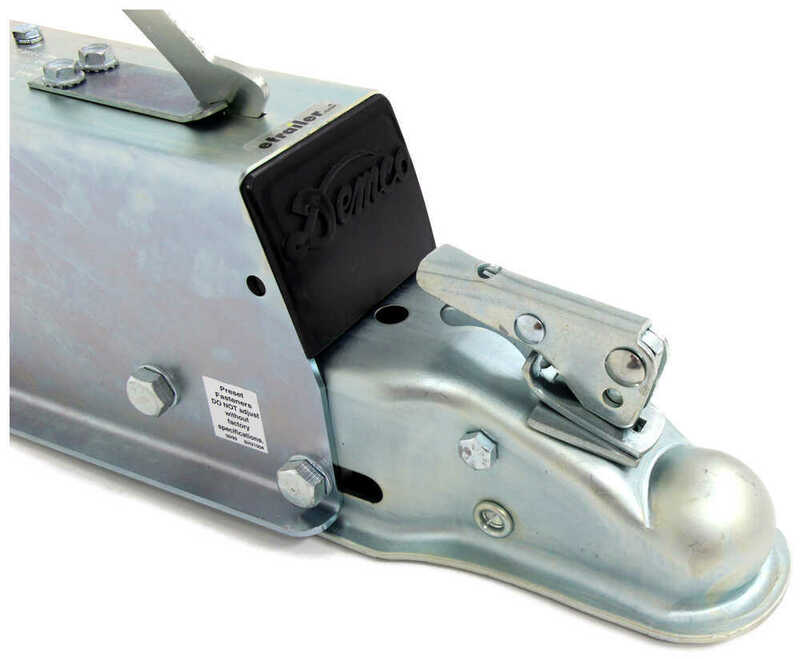 This is the Demco Surge Brake for Disc Brakes. This is a bolt-on installation and see the mounting holes. There's two on this side and there's two on the other side, and this would apply our install onto a 3-inch wide straight tongue trailer. A 3-inch wide is the inside measurement right here. The mounting holes, they have a measurement from center to center of 3 inches. Now, it does require the use of two 1/2-inch by 4-1/2-inch grade 5 bolts. They would go through here and bolt on to the other side through the trailer tongue. Now, this also fits the 2-inch hitch ball. It does have the electric solenoid on the back for the reverse lockout feature. This actuator does have a 6000-pound maximum weight capacity and a 600 pound maximum tongue weight capacity. This actuator is also zinc plated for marine application use. Now, the way a surge brake actuator would work is this is attached to the hitch on or the hitch ball on your tow vehicle. So when the tow vehicle is applying the brakes and slowing down, the weight of your trailer will be pushing this actuator forward. You can actually see the bolt, the elongated holes right here, would actually move it towards the vehicle. What would happen is there's an actuator right down here that you can see and that would actually telescope. When it does that it will actually push on the push rod of the master cylinder which would in turn apply the hydraulic pressure to the trailer brakes. So basically, when this is hitched to your tow vehicle and you're stopping this would compress forward. Have the actuator move the master cylinder. The brakes would be applied and your trailer would stop. Now, this reverse lockout feature right here, this is used when you're going to be backing up. So if you're in a situation where you need to back up with the trailer connected, you did not want the brakes to be applied when backing up. What you'll do is your trailer brake line would actually connect into the solenoid. There's a little red cap here that you would take out and the line would connect into there, and then there are two wires. One would be grounded. The other one would connect to the reverse light wire on your tow vehicle. So basically, what that does is then when you put your vehicle in reverse that would send a charge to the solenoid which would then block off the pressure from the master cylinder to the trailer brakes. That way, the brakes would not be applied and you'd be able to easily back up. Now, a few features on this. The master cylinder cap right here at the top that we can unscrew has a nice automotive style rubber diaphragm on it that helps keep the system completely enclosed. Another little thing they did is right here where you put your brake fluid into your master cylinder. They actually have a raised fill plate. Turn it a little bit. Maybe you can see it better. It's actually raised and one nice little feature about that is, usually, on a coupler is if you took your cap off, that would be flushed and even with this which are topping your coupler. Well, if there's dirt or grime on there it could fall into your master cylinder which you dont want that to happen. They've actually raised this a little bit, so when you take your cap off the dirt would not fall into the master cylinder. Now, it also has on the master cylinder itself, there is a you can't see. That's underneath here, but there's an actual rubber bellow boot that is on the push rod of the master cylinder. Again, that will help keep any moisture or dirt from getting inside the master cylinder and damage it. Now, the master cylinder that's underneath here is actually made of a long-glass reinforced nylon and that's a composite material. They do that because of strength and it also eliminates the rust and corrosion factor, so you dont have to worry about that. It could last quite a long time. Also, the cylinder itself is built larger so it has a 20% more capacity and that will ensure adequate brake fluid supply. Basically, when you attach this to your 2-inch hitch ball you'll just pull up on this trigger. Unlatch it. Drop it on to the hitch ball. Once it's on the hitch ball, push it close and the trigger latch will lock into place. Then to further protect to give you security is these holes line up. You can actually run a coupler lock right through here and prevent anybody from taking it off of your hitch ball. Now, this other nice feature here is on top that's actually a safety feature and it is required to be used. It is an emergency breakaway lever. What you would do is this hook with the keeper right here. You see. You would attach that to the tow vehicle itself. What that does is by chances if your trailer ever comes detached from your tow vehicle if it unhitches here at the trailer ball and go and falls away. You would pull this cable and this cable would break away and pull this lever forward. 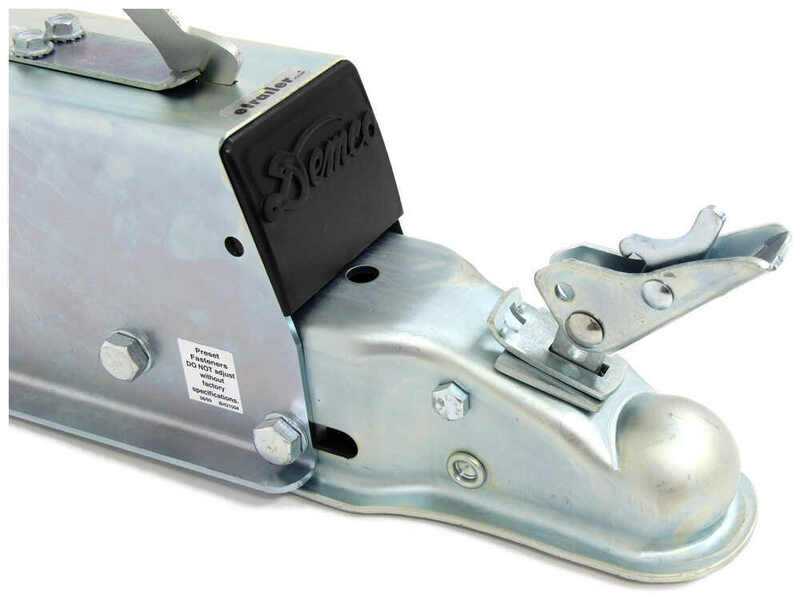 What that would do is that would actuate the master cylinder to send pressure to the trailer brakes immediately, so it would lock up the brakes right away to keep your trailer from a runaway situation. So it is a safety feature but then it's required to be used. That should do it on the review of part number 8605101, and that's the Demco Surge Brake Actuator for Disc Brakes. Order: RelevanceNewestRating - High to LowRating - Low to High Surge actuator has a corrosion-resistant composite master cylinder and zinc plating, making it perfect for marine use. Leverlock coupler latch is easy to use. Electric lockout activates automatically to keep brakes from actuating when in reverse. Do you have a question about this Brake Actuator? We have exactly what you are looking for. The disc brake version of your current Titan Model 60 is part # DM8605101. This actuator fits a 3 inch wide channel, and has a maximum weight capacity of 6,000 lbs. The coupler is compatible with 1-7/8, 2 inch of 50mm trailer balls. This actuator will supply the higher psi needed to actuate your new disc brakes properly. According to Demco, you will want to fill the brake fluid reservoir 3/4 of the way full with new DOT 3 or DOT 4 brake fluid. If you are bleeding the brakes, you will want to check the brake fluid level to ensure that it remains above half full during the bleeding process. Once you have finished bleeding the brakes, you can fill it to 3/4 full. Yes, the Kodiak Hydraulic Brake Line Kit # 18SI-BLKIT that you referenced uses the same fitting size that the Demco Hydraulic Brake Actuator # DM8605101 that you referenced has, 3/8-24. This would also work with a Kodiak disc brake kit like the # K2HR35D. 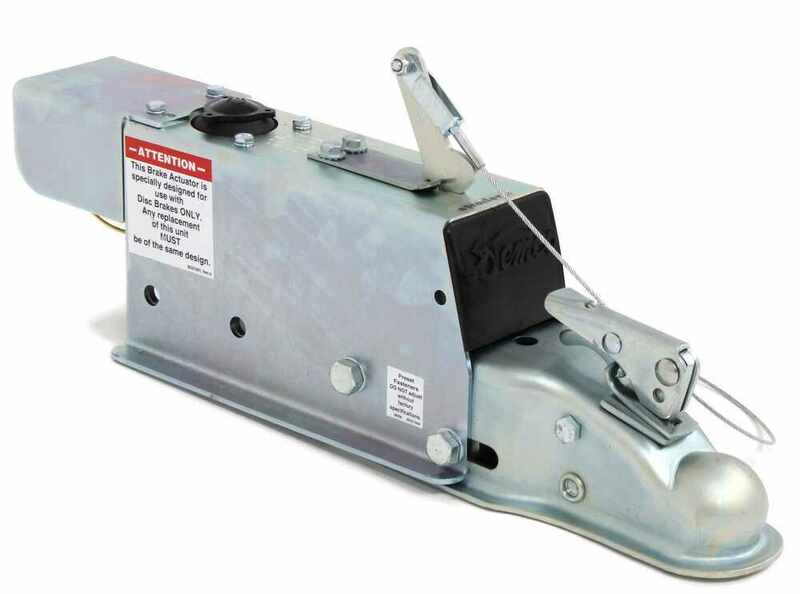 The Demco Hydraulic Brake Actuator # DM8605101 will work great for you; the 6,000 lb tow rating and 600 lb tongue weight rating are just the maximum capacities for the actuator and you won't have an issue with your single-axle boat trailer being under that weight rating. This actuator is designed for use with trailers that have disc brakes and it will fit a 2 inch hitch ball. I have added a link to a video review of the actuator for you to check out as well. Can a Surge Brake Actuator for Drum Brakes Be Compatible with Disc Brakes? Surge brakes do not have any adjustability. If you want to use them on steep hills your solutions would be best. Or you can look into an electric over hydraulic setup which will allow you to use a brake controller to activate the brakes. This gives you total flexibility and control. I attached a help article to this page that would walk you through the entire process of adding EOH brakes to a trailer like yours. Highest quality brake actuator for the best price. Most detailed, accurate brake actuator information available.